Colonia, YAP – Guam’s Track & Field Association had a fruitful ‘welcome back’ to the Micro Games by raking in gold medals. 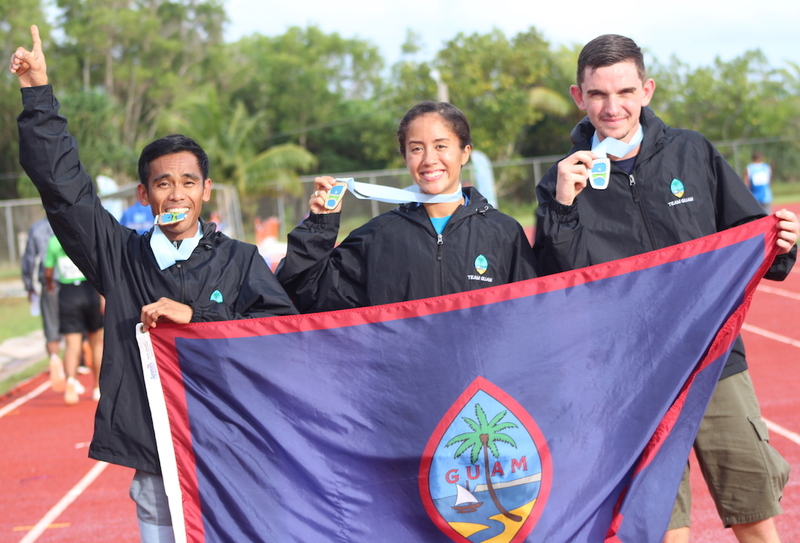 Starting with the early morning 10k, Ryan Matienzo (36 minutes, 16.32 sec) and Genina Criss (47 minutes, 54.49 sec) were the first Guam athletes to win a gold medal in the 9th Micronesian Games, winning the 10,000 meter run early Monday morning. Ben Middlebook (39 minutes, 45.49 sec) took silver finishing behind Matienzo. Guam then swept the long jump with track star Regine Tugade taking gold, former Bulldog Shania Bulala taking silver, and current JFK Islander Richelle Tugade grabbing bronze. Tugade breezed through the 100m race to take gold with teammate Shania Bulala taking bronze after getting edged at the finish line by CNMI. Genie Gerardo took gold in the javelin throw. Guam’s male runners also competed in the 400m, 100m races. In the 400m, Guam will be represented in the finals by Joseph Aguon and Darin Pascua.